Crystal Cove State Park, Laguna Beach, Orange County, CA. 9/5/08. © Peter J. Bryant. Boat Road, Laguna Beach, Orange County, CA. 1/18/09. © Peter J. Bryant. Upper Newport Bay, Newport Beach, Orange County, CA. 10/03/05. © Peter J. Bryant. San Mateo campground, Orange County, CA. 6-8-12. © Robert Gorman. 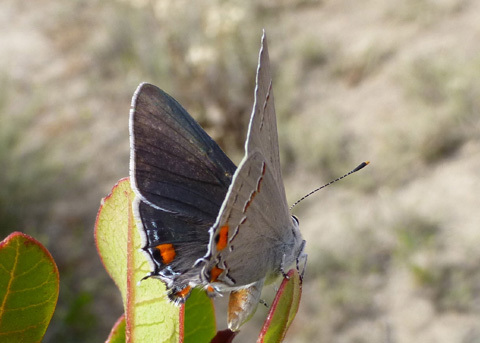 Characteristics: Gray-black on the dorsal wing surfaces of fresh specimens, light gray on ventral wing with a few red and blue markings on ventral hindwing and one distinct row of dark and white markings on ventral surfaces of both fore and hind-wings. The abdomen of the female is reddish. Forewing length: 13-17 mm. 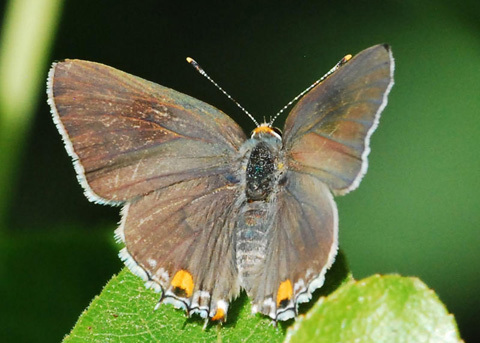 Similar Species: The ventral wing pattern of melinus pudica somewhat resembles that of many of our other local "hairstreaks". 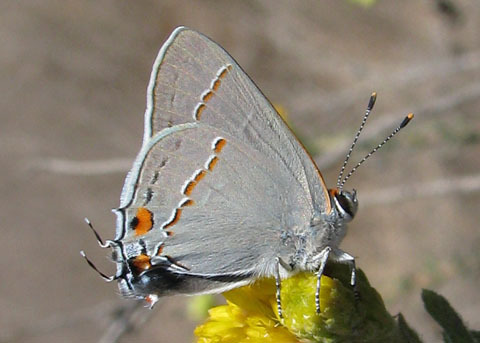 The dorsal wing color, however, should distinguish melinus pudica from Satyrium saepium, S. sylvinus, and S. californica, all of which possess a brown hue on the dorsal wing surface. 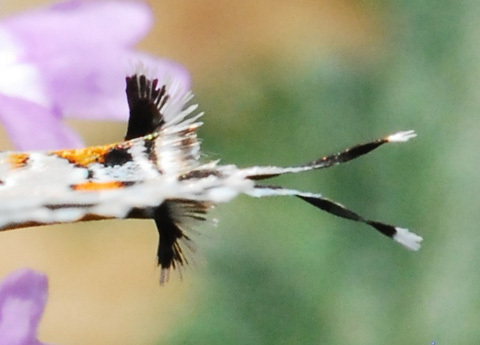 The dorsal wing of S. tetra, however, is basically the same gray-black color. 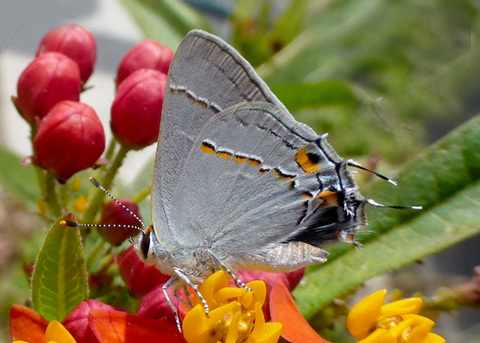 Habitats, Behavior: The adults often are found frequenting backyard flowers. 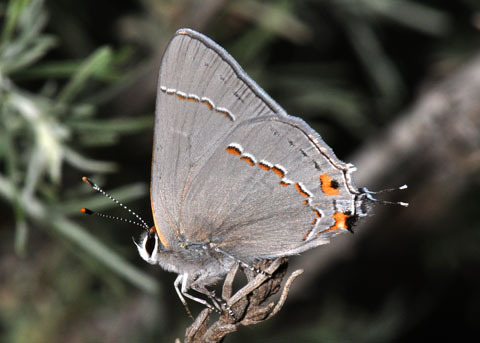 Emmel and Emmel (1973) and others note that melinus often moves the hindwings together in a rubbing motion while at rest. The cause of this behavior is not definitely known. 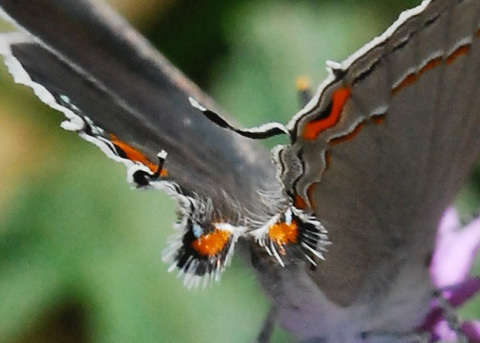 It is suspected by Wickler (1968) to help draw the attention of potential predators to the false eyes and antennae--simulated by the thread-like hindwing extension and dark spots on the ventral hindwing. 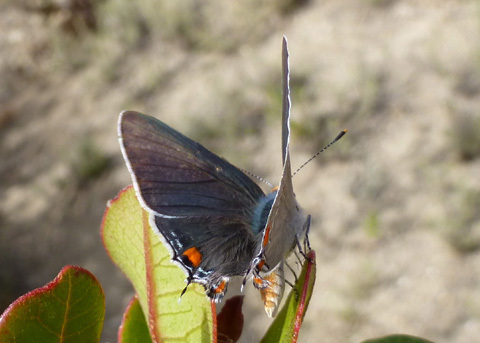 In any case, it is a behavior frequently observed in many lycaenid butterfly species. Flight Period: Emmel and Emmel (1973) list this as February to November. Our Orange County records currently extend from May to September. The species occurs in greatest abundance in June and July. Multiple brooded. Larval Foodplants: In the suburbs the larvae are often found on cultivated Hibiscus flowers or leaves. 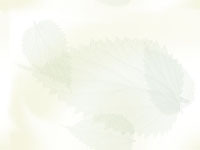 Malva, Humulus (hops), Amorpha (false indigo), Nolina, Polygonum, and Eriogonum are also listed by Emmel and Emmel (1973) and all are conceivably used locally. I reared one larva from Salvia mellifera (Black Sage) in the Arboretum area at U. C. Irvine and this plant may be utilized in our coastal sage-scrub vegetation areas where melinus sometimes occurs. Another native plant which may be utilized locally is California Coffee berry (Rhamnus californica), since a larva has been found recently on this plant at Albany, California. Jack Levy has found a larva on still another locally occurring (but non-native) plant, Cassia alata, in the arboretum area of U. C. Irvine. Thus, plants of many families are utilized. Other Remarks: The larvae occasionally become economically important pests in bean and cotton fields. In the latter, they are known as cotton-square borers.